Apistogramma agassizii Steindachner 1875, Agassiz' Dwarf Cichlid. Found in the Amazon Basin, Amazon-SolimÃµes River from Peru through Brazil to the Capim River basin To 4.2 cm. standard length. pH 5.0-7.0, dH 0.0-12.0, temp. 26-29C. A semi-touchy species requiring softer, warmer water than many other dwarfs. A wild type and a "Flame" individual pic by NealeM at right. A "Flaming Red" one below at Interzoo 2010. Apistogramma cacatuoides Hoedeman 1951, the Cockatoo Cichlid. Found in the Amazon Basin, Columbia, Peru, Brazil. To two inches standard length. pH 6.0-8.0, dH 6.0-19.0, temp. 24-25C. A hardier species, much prized for its beauty and steadily produced in captivity. A male in a fish shop in New Jersey. Another "Double Red" pic by NealeM. Apistogramma macmasteri Kullander 1979, Macmaster's Dwarf Cichlid. South America; Orinoco River basin, in the upper Meta River drainage. Males to 5.5 cm., females to 5.0 total length. Aquarium photos. Apistogramma steindachneri (Regan 1908), Steindachner's Dwarf Cichlid. South America; Suriname and Guyana. Males to four inches, females to three total length. Aquarium photo. 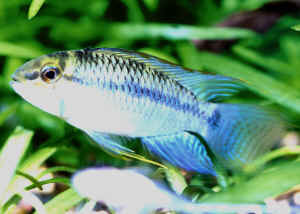 Microgeophagus ramirezi (Myers & Harry 1948), the Ram Cichlid. South America; Venezuela and Columbia. To two and a half inches in length. Cond.s: pH 5-6, dH 5-12, temp. 27-30 C. The most popular South American Dwarf Cichlid, frequently suffering for being kept in inappropriate water quality, setting, and lack of food. Richter, Hans-Joachim. 1989. Complete Book of Dwarf Cichlids. Tropical Fish Hobbyist Publications, NJ.